Through multibank cash concentration, you benefit from automated liquidity balancing among your Credit Suisse account and your domestic and foreign accounts with other banks. Multibank cash concentration is Credit Suisse's solution for the automatic balancing of liquidity among your Credit Suisse account and your other accounts in Switzerland and around the world. Inclusion of your existing accounts with other Swiss and international banks. Better overview of and easier access to group-wide liquidity. Group-wide optimization of the interest situation. On request, intercompany interest can be calculated and booked automatically based on individually specifiable intercompany interest rates. Cost savings and automation of manual employee activities in the treasury function (e.g. concentration of liquidity, settlement of intercompany interest). Simplified reclaiming of withholding tax in Switzerland and abroad (provided that a double taxation agreement exists). 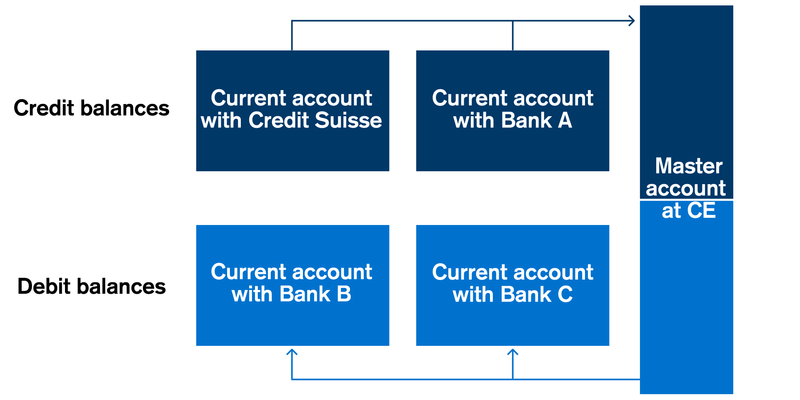 Through multibank cash concentration, automatic liquidity balancing takes place among the accounts that you hold with other financial institutions in Switzerland and abroad (third-party accounts) and your master account with Credit Suisse. You can agree your own frequency and limits with Credit Suisse. You also have the option of entrusting Credit Suisse with the crediting or debiting of intercompany interest. Who Could Benefit from Multibank Cash Concentration?